← Slow Stitching Mother’s Day! I feel as if I haven’t been in the sewing room for days and not much is likely to happen today. Laundry is piling up, the kitchen needs cleaning and I’m going to have a fun day with Daughter #1 and 3 working on the apartment. Such is life. But I do have a couple projects in the design stage. This is what is on the design wall at the moment. I didn’t get far on the wedding quilt for my nephew yesterday. 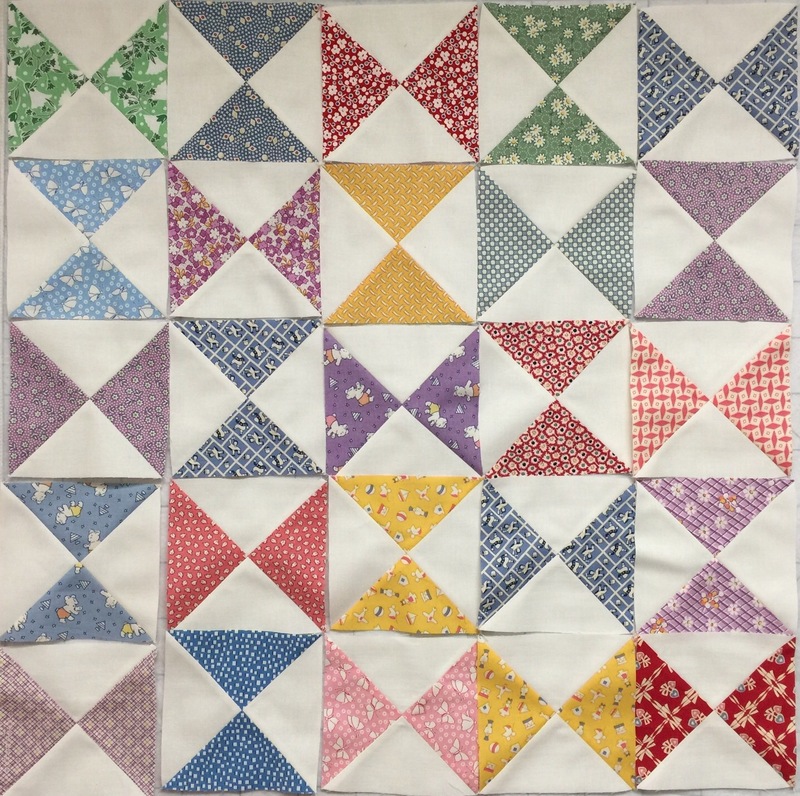 I have gotten the backing loaded and the batting cut and I do hope to start the quilting today. But there is another design project on the horizon. My dad not only saved the two sewing machines for me from the estate of my great aunt, but he grabbed a few boxes of fabric as well. In one, were these fabric samples. They might find their way into this project….. This is a job I’m going to have to really think about. The chair will live in my sewing room and I want it to be wild and funky. And I want to do some free motion quilting on it. I have redone a couple small rockers and this seems fairly simple, but it is still a bit (a lot) out of my comfort zone. That chair will look spectacular when you have it finished! Have fun with it! I’ve seen the patchwork chairs and they’re wonderful. Go bright and bold and just have fun! I REALLY LIKE THE FABRCS YOU HAVE SHOWN, BUT DON’T THINK IT WILL BE ‘wild and funky’. Cannot wait to see what you come up with. Very fun chair and those three fabrics would look great as part of the patchwork covering. Looking forward to seeing where you take that project. Very interesting project with the chair. Can’t wait to see what you’ll do with it. 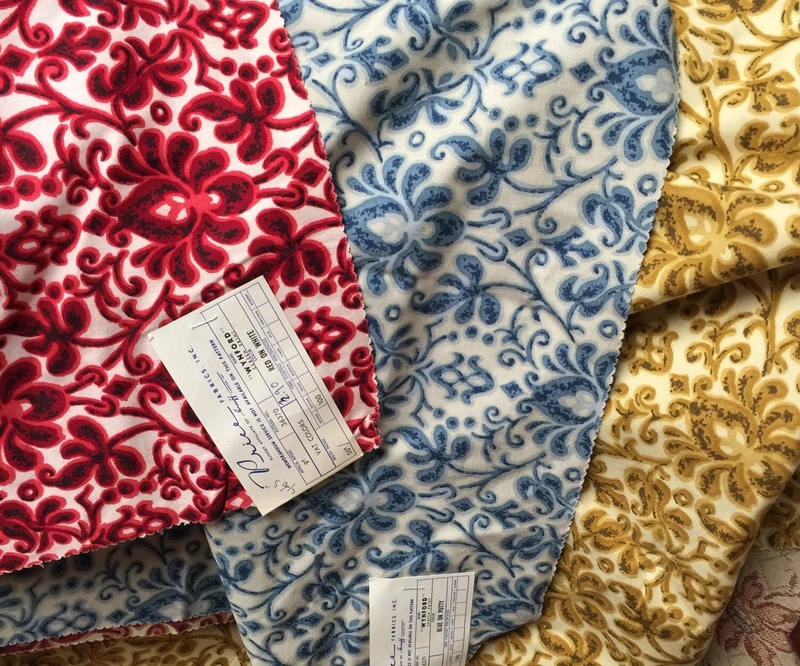 The fabrics are gorgeous. If I were you, I wouldn’t be able to wait for an idea. I would just dive into this project and let it guide me through. Enjoy! Love those 30’s windmill blocks! And that chair is very interesting….don’t think I have ever seen that particular style before….looking forward to seeing what you do with it….I think your idea to reupholster with patchwork is great! 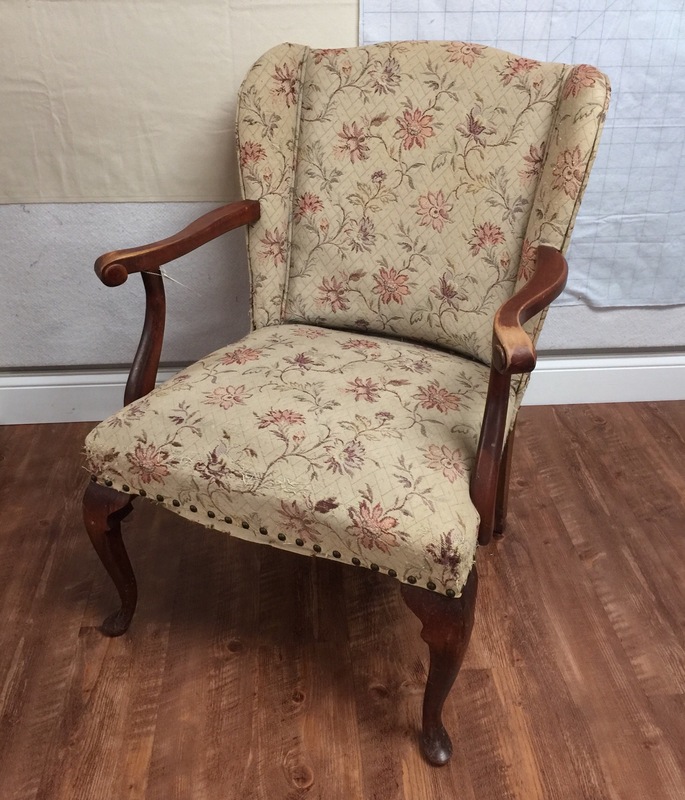 Particularly since you mentioned putting it in your sewing room….I have done some upholstery work over the years, and I think you will be fine….I have found that if I am very careful taking the old fabric off, I can use it as a pattern…that works pretty well. Or, if the old fabric is better left intact, I have used some inexpensive muslin to create a pattern. That works better than trying to use paper….at least in my experience. Sounds like a fun project! Cannot wait to follow along! Have fun with your daughters! What a fun idea to have a patchwork chair in your sewing room–and using some of your great-aunt’s fabric will be a nice touch. Good luck with it! Ooh! Chair redo’s. I LOVE looking at those. Haven’t had the courage to try it myself yet. So excited to watch you work on this chair project Katy – I know it’s going to be awesome!!!!! Have a fun day with your beautiful daughters. It will be one more precious memory for you all to talk about in the future. I’ve seen chairs upholstered in patchwork … so neat. I can’t wait to see yours! Looking at your design wall, did you notice that the yellow block in the lower right corner is turned the wrong way? Maybe it was your intent. I too have a chair that I want to try covering. Good luck with yours. Haven’t worked with 30’s in a while so you have inspired me there too. looking forward to seeing how your chair ends up. Love the 30’s blocks! And I wish you every success with your beautiful new chair project. I love that chair, I hope you post a pic when you’ve recovered it. Enjoy the time with your daughters! The chair project looks like fun. I’ve often thought of doing that, but haven’t found the chair (or the room for it) yet. Looking forward to seeing your progress. ooo! I can’t wait to see what you do with that chair. I have a couple things myself that could do with some rec0vering… can you share a picture of the “smaller rockers”? I ‘d love to see!